Leave it to a group of big-hearted Spring Hill teenagers to come up with a project that involves both fuzzy yellow ducks and chocolate on a stick. Last September, Makenzie Fancher, Nikki Vaughen, Niki Hutchinson, Olivia Chastain, Kelli Messmer and Carly Smith were given a challenge by the Spring Hill Rotary Club. They had to find a way to use just five dollars each to make a meaningful contribution to their community. The girls, all tenth graders at Summit High School, decided to pool their cash and chose cancer as the cause they would work to support. The girls were even more thrilled to discover the founder of the Chemo Duck program, Gabe Sipos, was a student at nearby Allendale Elementary School, where Makenzie’s mom is the PTO president. It just felt right. The six friends decided they would make chocolate lollipops and sell them for a dollar. Soon the Fancher kitchen became a miniature version of Willie Wonka’s chocolate factory and the girls were cranking out dozens of pops in all different shapes and shades. “We had white chocolate and dark, we made duck pops, mustache pops, stars and hearts. Everyone loved them,” said Makenzie. Over the next several weeks the girls sold the pops in their neighborhood, took them to football games and their dance studio. 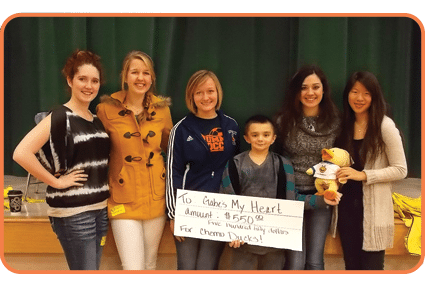 By the time the Rotary Club was ready to convert their earnings into a check for Gabe’s My Heart, Inc., the girls had raised $550. On November 16, the group surprised Gabe with a check at his school. Now 18 Chemo Ducks are on their way to the pediatric cancer patients at the Monroe Carell Jr. Children’s Hospital at Vanderbilt. Makenzie says it was very gratifying to see the surprised expression on the faces of the Rotarians when they learned they’d increased their money more then tenfold, but it was even better getting to meet Gabe, and seeing how excited he was about the donation. “I hope we show what teens can do. I want people to learn from us that even though you are young you can make a difference and change a life, not just in something small. You can set your mind to it and can change many people’s lives,” Makenzie said.